With a history that spans more than 300 years, Ippodo Tea Company in Kyoto is known as the purveyor of the highest quality green tea in Japan. Ippodo harvests its tea in the Uji region of Japan, the country’s oldest tea-growing area, which spans Kyoto, Nara, and Shiga Prefectures. Last March Ippodo opened its first international store in New York, where it shares space with Kajitsu, the Michelin-starred Japanese shojin cusine restaurant. While Ipppodo’s New York location is not a café where you can sit down and enjoy a freshly brewed cup of tea, it is a place where you can purchase a variety of premium Japanese green tea leaves, handcrafted tea pots, and exquisite accessories. 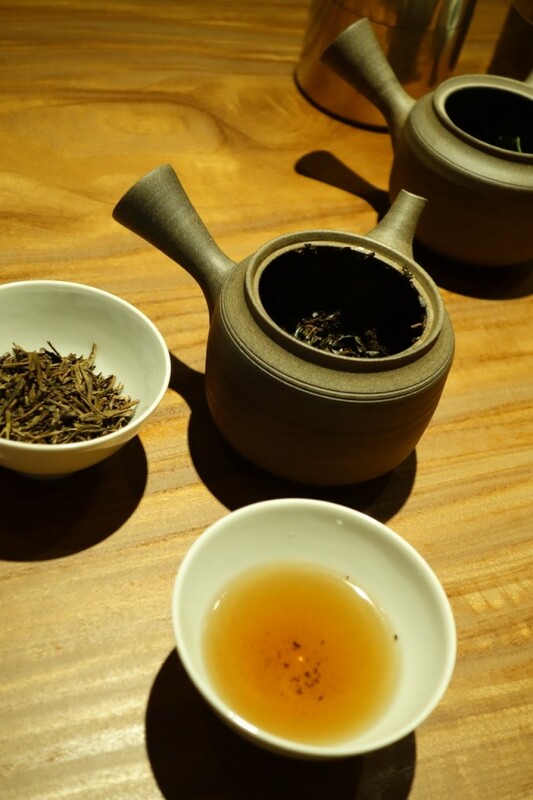 Japanese tea aficionados and novices alike may request to taste a kind of tea before buying it. Ippodo invited JapanCulture•NYC to an exclusive tasting. 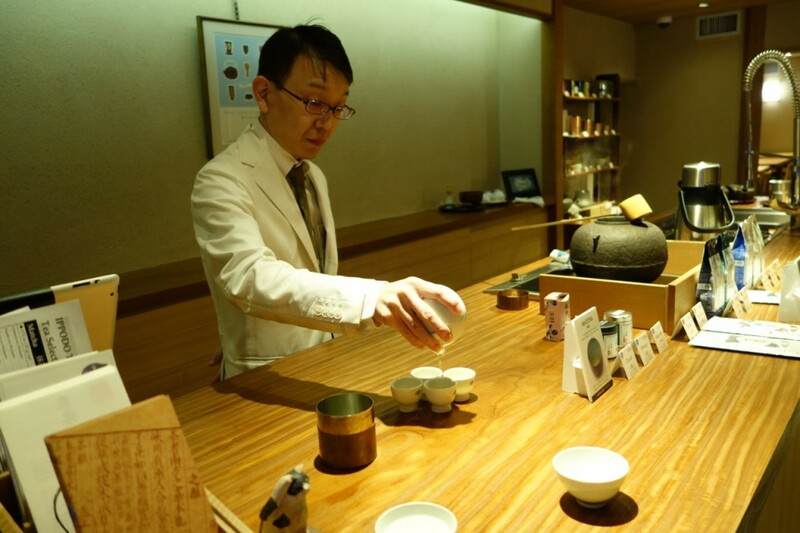 While sales manager Riichiro Kato prepared five different types of tea, sales associate and tea consultant Chihiro Kimura described each one. 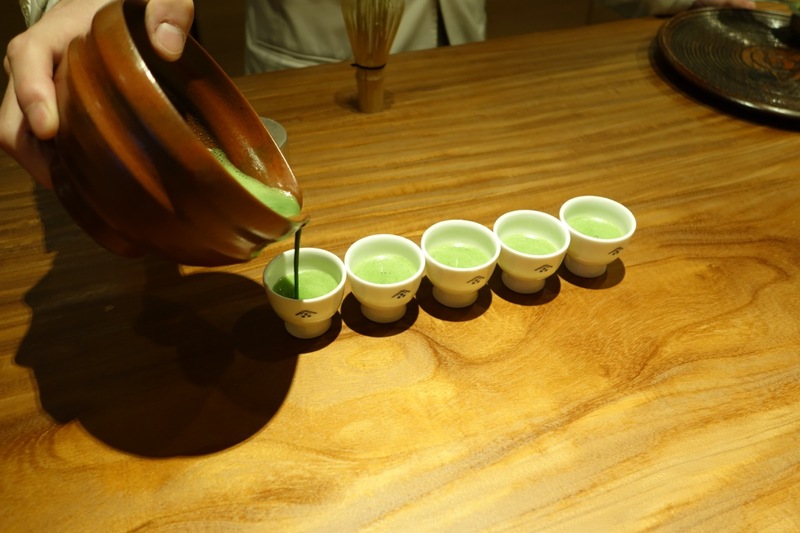 The vibrant green color and the frothiness are easily recognizable as the quintessential green tea served at tea ceremonies. 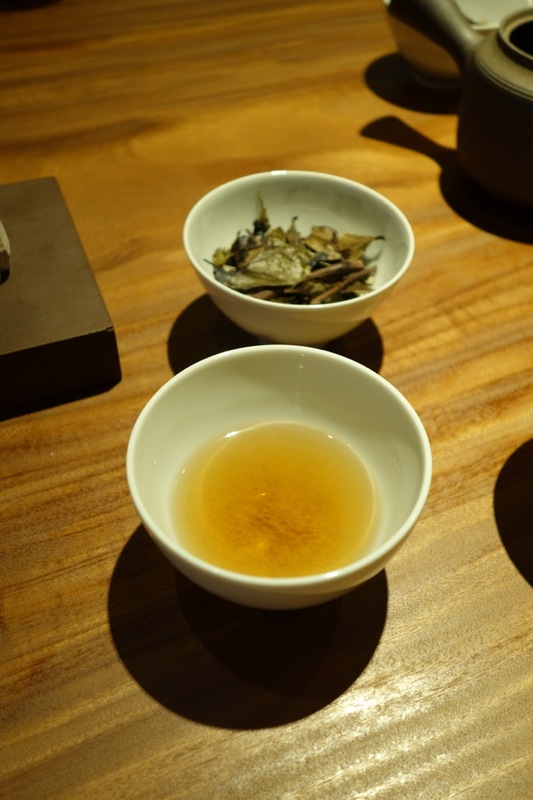 There is a surprising hint of seaweed flavor, reminiscent of the kombu in dashi stock. Kimura recommends brewing Gyokuro at a lower temperature than other teas (140° compared to 180°) and steeping it for a longer time. “Matcha and Gyokuro sit in the shade for three weeks before harvest, so it is less bitter and has more umami,” says Kimura. Most people are familiar with this type of green tea, and Kimura says that the Hosen type of Sencha is the most popular at the store. Kajitsu also serves it to their customers. 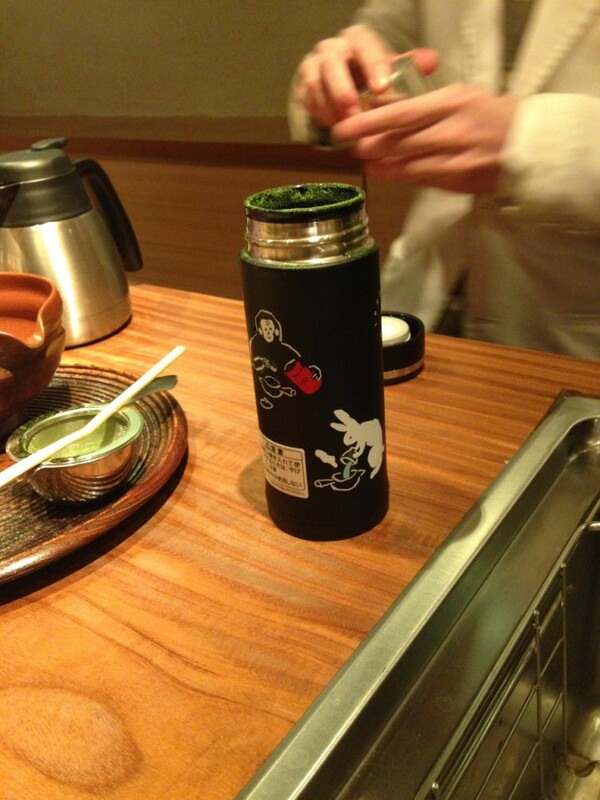 According to Kimura, Sencha should be brewed at 180° and steeped for one minute. This roasted Sencha hearty flavor and is lower in caffeine than Matcha, Gyokuro, and regular Sencha. Kimura says that many people outside of Kyoto don’t know about Iribancha, whose unrolled leaves have a distinct smoky scent, very close to that of tobacco. It doesn’t taste like smoke, though. It has nice flavor with no bitterness. Ippodo has a to-go menu for made-to-order teas. 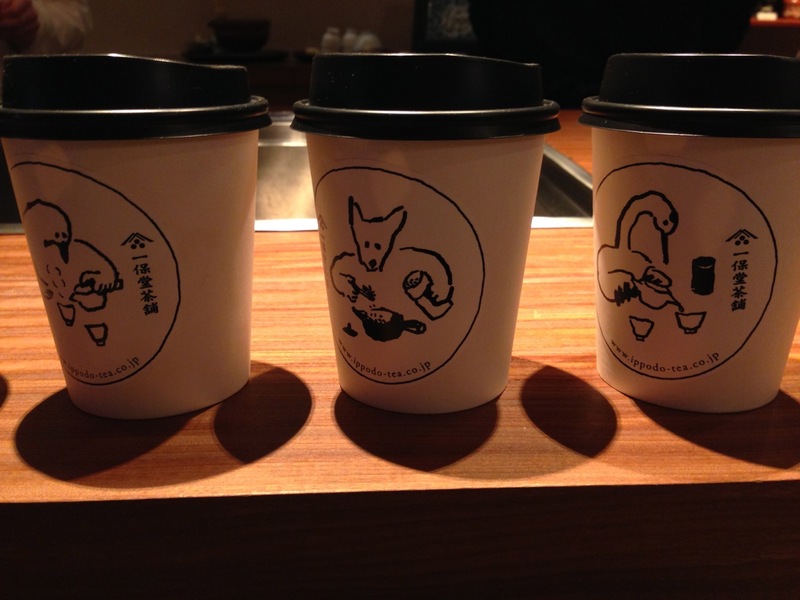 And cute to-go cups. Kimura says that most of Ippodo’s New York customers are Westerners who are knowledgeable about Japanese tea and have even visited one of their stores in Japan. “Most non-Japanese are more interested in Matcha and tea ceremony, and we tell them about our other types of tea,” says Kimura. For Ippodo’s Japanese customers who are already familiar with the varieties of green tea, Kimura introduces different ways tea can be brewed. 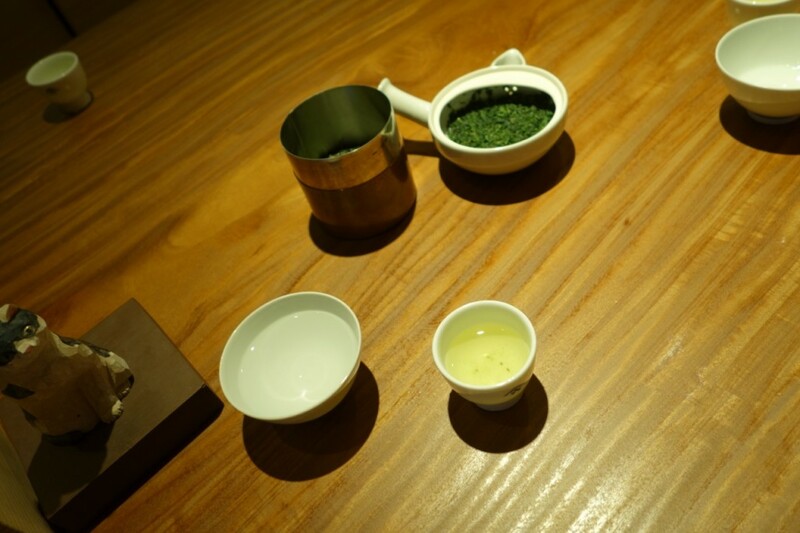 For instance, Gyokuro can be brewed with iced water, which releases more umami because it takes about 30 minutes for the tea leaves to unroll. Kimura recommends using the smallest teapot for premium teas such as Gyokuro because you don’t use too many leaves and “you can control the taste.” Ippodo sells a number of teapots – small and large – from Kyoto as well as Tokoname in Aichi Prefecture, which has some of the oldest kilns in Japan. You can also find tea containers, a Matcha starter kit for beginners, and a “travel flask” where you can make refreshing Matcha on the go. In April Ippodo will conduct a workshop in conjunction with Kajitsu, pairing tea with Japanese food. The workshop will be limited to 15 to 20 people. Stay tuned for more information! Ippodo Tea Company is located at 125 E. 39th Street between Lexington and Park Avenues. Store hours are 11:00 a.m. until 7:00 p.m. Tuesday through Sunday (closed Mondays). No appointment necessary. For more information, please check Ippodo’s website and Facebook page.